We find in evolutionary astrophysics books the description of the suns luminosity being concluded as unchanged for hundreds of millions of years, due to the evidence that is found in fossils. p. 21, 1st paragraph 8th line. We can see that other evolutionary ideas about stellar lifetime reveals a mathematical need for a constantly inclining luminosity, which is contrary to all the physical evidence we have. 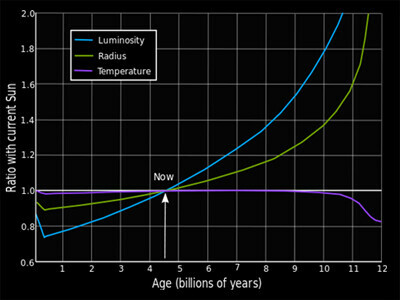 If 100 million years = 1/100 of the entire lifespan of the sun, then we should expect to see a difference in the ‘fossil records’ per every 100 million years. The fossil records should reveal what the intensity of the suns luminosity was at the time of the creatures death and its exposure to the sun. As different intensities of the suns radiation would have different effects on fossils at different times. Yet, we only observe a consistent ‘fossil record’ revealing the suns luminosity has been without any change throughout the entire chronology of the Earth. If the Old Earth Theory was correct, we should see evidence, roughly a 1% difference per every 100 million years, but in contrast we find only uniformity in all ‘fossil records’. Looking at the chart above we can see the estimation of how intense the suns luminosity has been throughout its life cycle. We can see that it appears that we just so happen to be alive on the earth during the perfect equilibrium point in the suns time frame. This allows for the perfect conditions to exist on the earth for life to flourish. It seems to be quite a convenient coincidence that we just happen to be in the current ‘equilibrium’ of the suns lifetime, yet pointing to the anthropic principle!